When we first met our clients Kate & Brad, they expressed an interest in having an invitation design that no one had previously used. Excited to be given the opportunity to work with a completely couture creation, we searched through our suppliers to find new products. Thanks to Kate & Brad, we found that one of our suppliers made a panel invitation with a pocket on the back. We worked with the navy panel pocket, light pink metallic backing and white invitation panel to create this beautiful invitation. 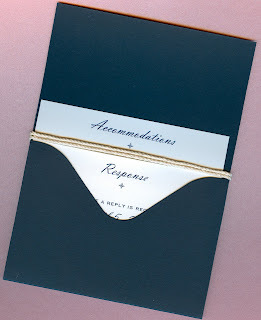 To give it a little nautical flair, we incorporated the knotted rope design we had used on an invitation in the past. The end result is a completely new pocket invitation design in beautiful colors, enjoy!